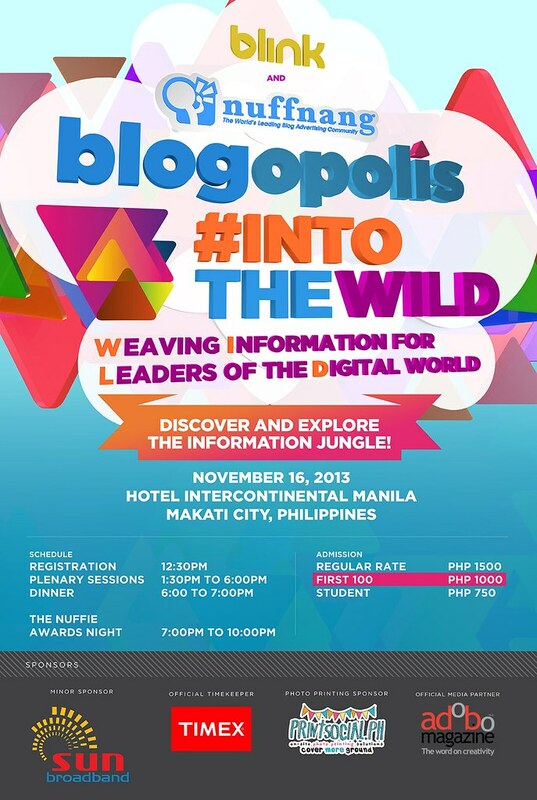 Blink and Nuffnang Presents Blogopolis Into The Wild! Last year was great when they discussed tons of topics about blogging and the community has definitely benefited from it. Now, they're even doing it better by involving social media and how we can take advantage of its benefits. Businesses should be smart enough to learn a thing or more about how to survive the wild. Diving into the visuals, learning from experienced people in the industry might just be the best thing this brings. This is blogopolis #IntoTheWild! Hurry and register! This is happening on November 16, 2013 at the Hotel Intercontinental Manila in Makati City. The Nuffie Awards night will happen also after the event. You get to learn, dine and see who's the current "IT" person in the Philippine blog world. Get on your feet and check out http://blogopolis.ph if you wish to purchase tickets for the event.